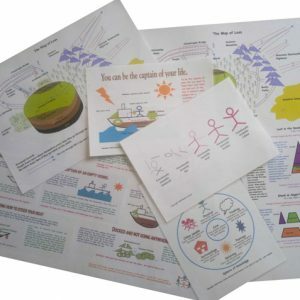 Below is a range of charts and postcards derived from the books that W.I.S.D.O.M in Your Life has a range of charts and postcards. The postcards are often used by mental health practitioners and are available in packs of 100 or individual. All the charts are in full colour and laminated. Some people display the charts on their fridge or the toilet door.